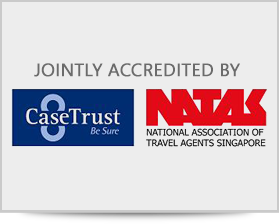 The Consumers Association of Singapore (CASE) and The National Association of Travel Agents Singapore (NATAS) are pleased to announce the launch of The Joint Accreditation Scheme for the travel industry. This Joint Accreditation Scheme, which sees the fusion of similar goals between the two associations, will augment existing procedures to improve the travel industry as a whole in Singapore. Consumer confidence will be boosted especially since accredited travel agencies promote fair and ethical business practices. Being CaseTrust accredited, it would mean that these agencies have passed stringent assessment which includes good sales and after-sales service, business integrity and well-trained sales staff. List of CaseTrust-NATAS Joint accredited Travel Agencies can be found here.